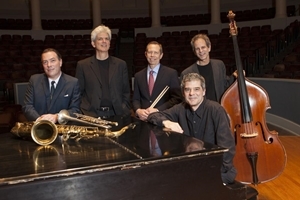 Over the past two decades the Free Bridge Quintet has performed over forty concerts in Old Cabell Hall as well as many outreach and community events. Founded in 1997, it features Jeff Decker on saxophones, Robert Jospé on the drums, Peter Spaar on bass, John D’earth on trumpet and flugelhorn, and Butch Taylor on piano. The quintet has been a staple of not only the UVA and Charlottesville jazz scene, but also the greater Central Virginia jazz scene for more than two decades. The quintet is known for its tributes to the giants of jazz including Duke Ellington, Charlie Parker, Dizzy Gillespie, Thelonious Monk and John Coltrane as well as presentations of its own innovative works. The quintet has also performed with many internationally reknowed guest artists such as Pat Metheny, Cyrus Chestnut, Kurt Rosenwinkle and John Abercrombie.